Microsoft has a lot riding on the success of Kinect but says that first-party developers are not being pressured or forced to incorporate support for the device into their games. I hadn't really thought about it one way or the other, to be honest, but if I had, I would have assumed that Microsoft would put its foot down with development studios in order to ensure a substantial level of support for Kinect, its upcoming motion control gizmo for the Xbox 360. But Phil Spencer, corporate vice president of Microsoft Game Studios, says that's not the case at all; Kinect will "unlock potential" but it's up to game makers to decide what to do with it. "Fable III ships [this] week,‭ ‬and it's not a Kinect game," Spencer told Gamasutra.‭ ‬"I think I said this a year ago:‭ ‬I think there's opportunity in Fable for things that make sense with Kinect.‭ But... it's a trivial equation ... that people buy great games.‭ ‬And they buy the platforms that those great games show up on." He said Microsoft is committed to delivering the best experiences possible, which isn't a matter of mandating the use of features like Kinect or Xbox Live but of simply providing game makers with the tools to make really great games. "What we think we do is we unlock potential, and the creators usually want to take advantage of things like Live," Spencer said. "And you've seen now that Live shows up in almost every one of games, not because I stop on top and say, 'You have to.' But they just see the opportunity that's there. I think honestly that's really what you're going to see with Kinect. But I don't want to force it into places it doesn't belong." 16 launch titles have currently been announced for Kinect and while the lineup isn't exactly breathtaking, with titles like Dance Central, Kinect Joy Ride and The Biggest Loser, an impressive array of publishers including Bethesda, Activision Blizzard and Ubisoft are working on Kinect-enabled projects. 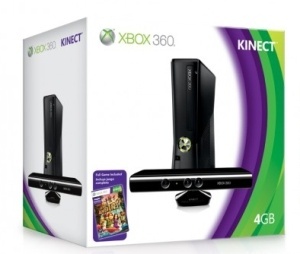 Kinect comes out in North America on November 4.